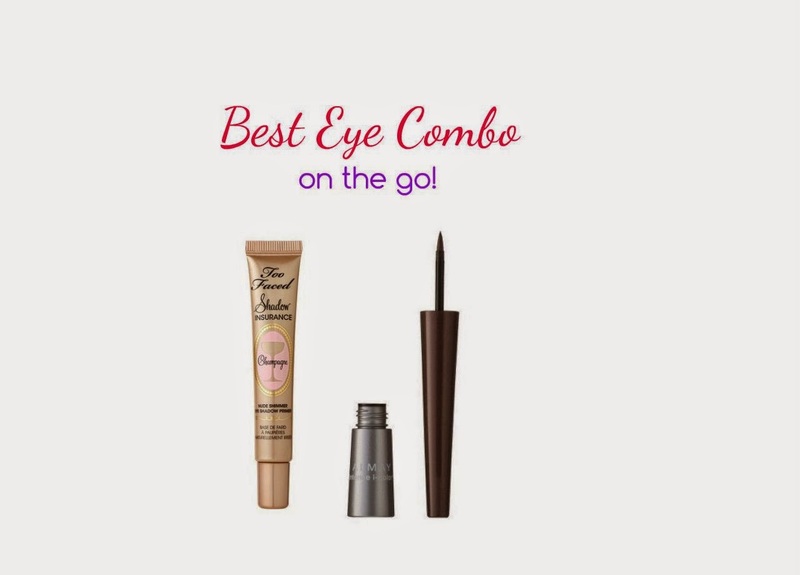 Best Eye Combo on the Go! I'm finally FINALLY back to normal and not horribly sick! Woo!! When I'm in a rush (usually at 5 a.m. getting ready for work) I tend to either put on a light eyeshadow and a great eyeliner or skip the shadow all together. It's easy and actually looks pretty without all the fuss of figuring out which color eyeshadow looks good with my outfit/other eyeshadows. And let's face it, I'm lazy when it comes to makeup in the mornings so the faster the better. I've found my perfect quick as can be eyeshadow & eyeliner combo. Too Faced Eyeshadow Insurance in Champagne - This is a primer and beautiful eyeshadow in one! I love love love the color & it lasts all day! They have 3 colors to choose from (a light yellow, champagne, & candlelight) but champagne is definitely my favorite! Also, when you order from their website they send you good sized samples of a few of their other products! Almay Intense i-color Liquid Liner - I use the Topaz color for blue eyes. (I actually have green and it looks amazing on with them) This has been my holy grail go-to eyeliner for years, but I hated because it wasn't waterproof and would come off 1/2 way through the day. Then I put it over the shadow insurance and it literally did not move, bleed, anything all dang day! It's perfect together. The best thing about this eyeliner? It's around $5!! Heck yes! What's your favorite products on the go?